If not, what are your alternatives? Millions of young adults across the globe — and their parents and mentors — find themselves asking these questions every year. To start, let’s dive into the value of graduate school versus apprenticeship — especially during this time of extraordinarily rapid growth, and the micro-diversification of careers. For complex technical trades like medicine, engineering and law, formal graduate-level training provides a critical foundation for safe, ethical practice. Ironically, business schools are facing a tough business problem. The rapid rate of technological change, a booming job market, and the digitization of education are chipping away at the traditional graduate-level business program. Enrollment in two-year, full-time MBA programs in the U.S. fell by more than one-third from 2010 to 2016. During the 2018 admissions period, applications to business schools in the United States dropped 7 percent from the previous year. Another signal of change began unfolding over the past week. You may have read news headlines about an emerging college admissions scam, which implicates highly selective U.S. universities, sports coaches, parents and students in a conspiracy to game the undergraduate admissions process. While 85 percent of U.S. employers expect to hire MBA graduates this year (a decrease from 91 percent in 2017), 52 percent of employers worldwide expect to hire graduates with a master’s in data analytics (an increase from 35 percent last year). But as exponential technologies permeate not only products but every part of the supply chain — from manufacturing and shipping to sales, marketing and customer service — that trend is changing by necessity. Over the past half-decade, we’ve seen schools with smaller MBA programs shut their doors in favor of advanced degrees with more specialization. This directly responds to market demand for skills in data science, supply chain and manufacturing. Regardless, this new specialization strategy is working and attracting more new students. Over the past decade (2006 to 2016), enrollment in specialized graduate business programs doubled. But some schools are slow to adapt, raising the question: how and when will these legacy programs be disrupted? A survey of over 170 business school deans around the world showed that many programs are operating at a loss. But if these schools are world-class business institutions, as advertised, why do they keep the doors open even while they lose money? The surveyed deans revealed an important insight: they keep the degree program open because of the program’s prestige. When you consider the 320+ unicorn startups around the world today, these numbers become even more impressive. 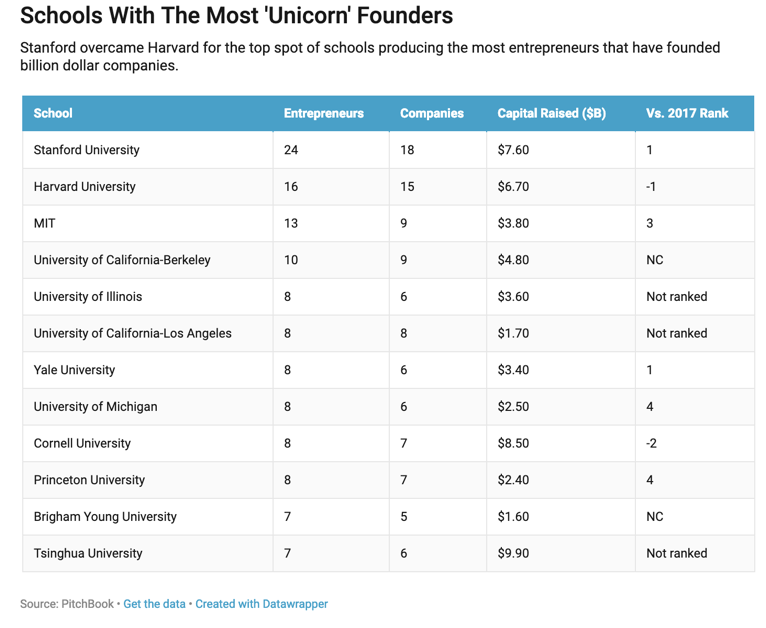 Stanford’s 18 unicorn companies account for over 5 percent of global unicorns, and Harvard is responsible for producing just under 5 percent. Combined, just these two universities (out of over 5,000 in the U.S., and thousands more around the world) account for 1 in 10 of the billion-dollar private companies in the world. It turns out that the University of Wisconsin-Madison leads the business school pack with 14 CEOs to Harvard’s 12. Beyond prestige, the success these elite business programs see translates directly into cultivating unmatched networks and relationships. Graduate schools — particularly at the upper echelon — are excellent at attracting sharp students. At an elite business school, if you meet just five to 10 people with extraordinary skill sets, personalities, ideas or networks, then you have returned your $200,000 education investment. From future investors to advisors, friends and potential business partners, relationships are critical to an entrepreneur’s success. When I think about the most important skills I use today as an entrepreneur, writer and strategic thinker, they didn’t come from my decade of graduate school at Harvard or MIT… they came from my experiences building real technologies and companies, and working with mentors. Startup accelerators are short-term (typically three to six months), cohort-based programs focusing on providing startup founders with the resources (capital, mentorship, relationships and education) needed to refine their entrepreneurial acumen. While graduate business programs have been condensing, startup accelerators are alive, well and expanding rapidly. In the 10 years from 2005 (when Paul Graham founded Y Combinator) through 2015, the number of startup accelerators in the U.S. increased by more than tenfold. 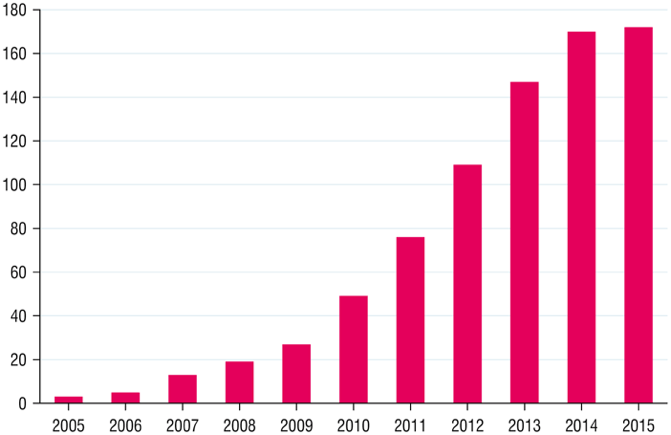 Figure: The number of startup accelerators in the U.S. from 2005 through 2015. Strike Force is an apprenticeship for the next-generation of exponential entrepreneurs. Every year, over 500,000 apprentices in the U.S. follow this precise template. These apprentices are learning a craft they wish to master, under the mentorship of experts (skilled metal workers, bricklayers, medical technicians, electricians, and more) who have already achieved the desired result. In my last blog on education, I shared how mobile device and Internet penetration will transform adult literacy and basic education. Mobile phones and connectivity already create extraordinary value for entrepreneurs and young professionals looking to take their business acumen and skill set to the next level. For all of human history up until the last decade or so, if you wanted to learn from the best and brightest in business, leadership or strategy, you either needed to search for a dated book that they wrote at the local library or bookstore, or you had to be lucky enough to meet that person for a live conversation. You can access a near-infinite stream of cutting-edge tools, tactics, and lessons from thousands of top performers from nearly every field — instantaneously, and for free. For example, every one of Warren Buffett's letters to his Berkshire Hathaway investors over the past 40 years is available for free on a device that fits in your pocket. The rise of audio — particularly podcasts and audiobooks — is another underestimated driving force away from traditional graduate business programs and toward apprenticeships. Whenever and wherever you want, you can learn from the world’s best. In the future, mentorship and apprenticeship will only become more personalized. Imagine accessing a high-fidelity, AI-powered avatar of Bill Gates, Richard Branson or Arthur C. Clarke (one of my early mentors) to help guide you through your career. The education system is rapidly changing. Traditional master’s programs for business are ebbing away in the tides of exponential technologies. Right now, you have access to world-class mentorship and cutting-edge best-practices — literally in the palm of your hand. What will you do with this extraordinary power? (2) A360 Dubai: Join me in Dubai, the City of the Future, for the inaugural Abundance 360 Dubai Summit on March 26 - 27, 2019. Hosted by the Dubai Future Foundation and the Crown Prince of Dubai, this two-day experience offers exponential leaders an immersive look into how technology will transform every industry. Read more about the program and apply here to join. (3) Abundance-Digital Online Community: I’ve also created a Digital/Online community of bold, abundance-minded entrepreneurs called Abundance-Digital. Abundance-Digital is my ‘onramp’ for exponential entrepreneurs – those who want to get involved and play at a higher level. Click here to learn more.